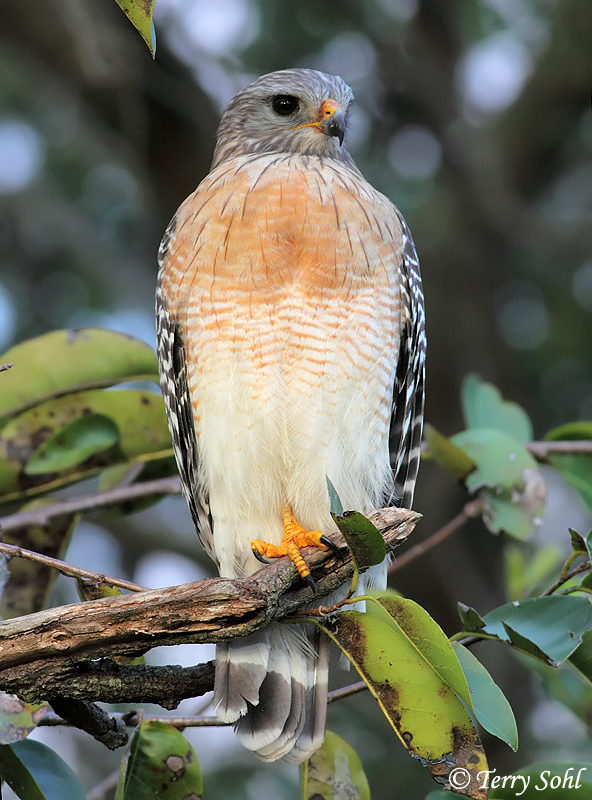 ID Keys: Narrow black and white bands on wings and tail in flight, rust-colored underparts, spotted upperparts. 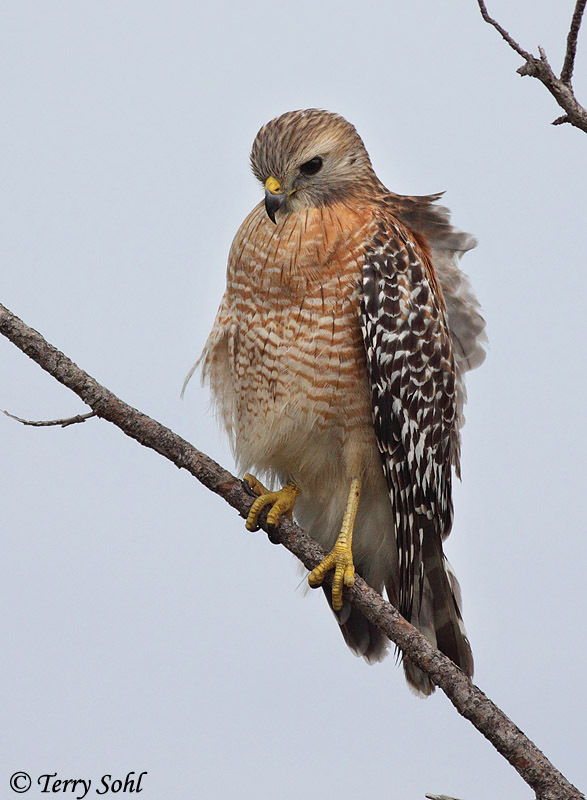 The Red-shouldered Hawk, a hawk of forests and woodlands, is just a casual visitor to South Dakota. 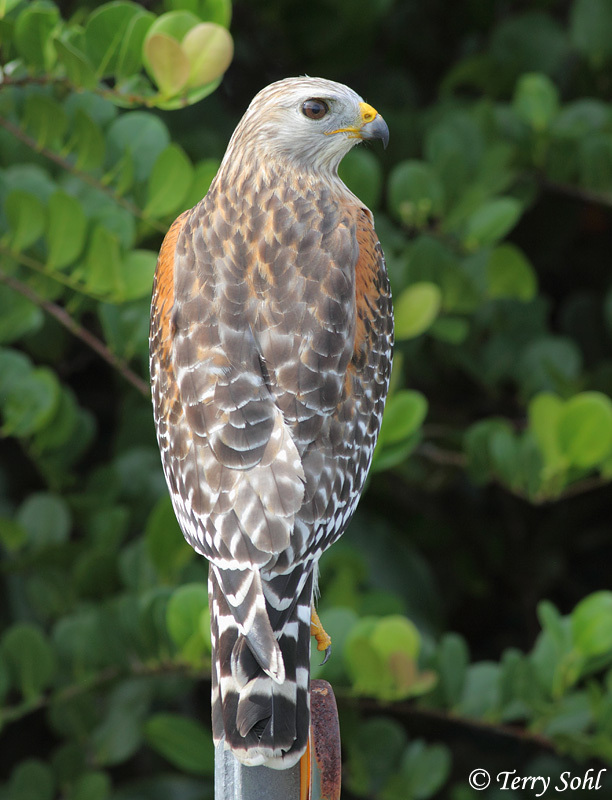 Several different color phases exist, but all mature birds have the characteristics listed in the ID Keys above. 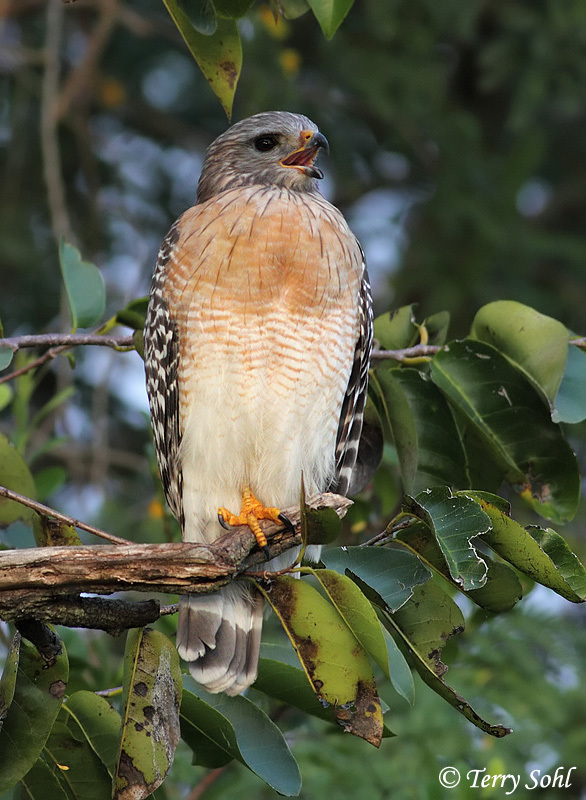 Given the forest habitat in which they are found, the noisy call of the Red-shouldered Hawk is often heard before the bird is seen. 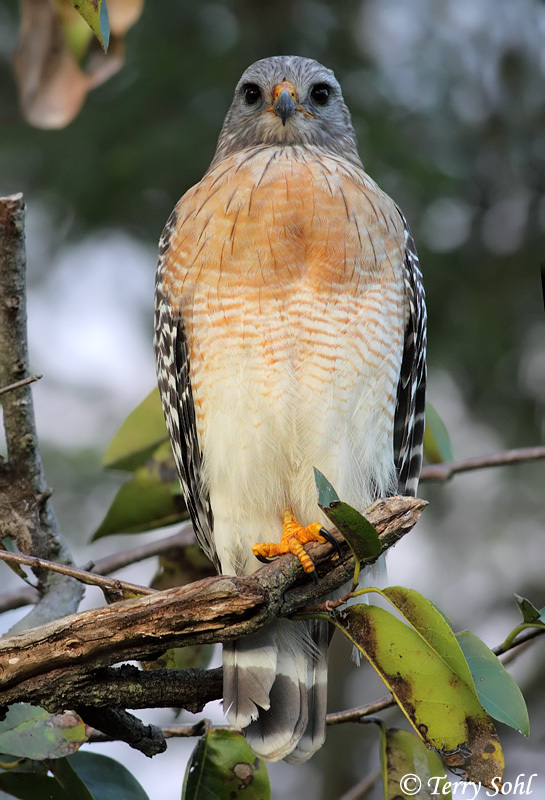 Habitat: During nesting season, they are found in deciduous and mixed forests, usually in areas with large trees and open understories. They can be found in more open habitats during the winter. 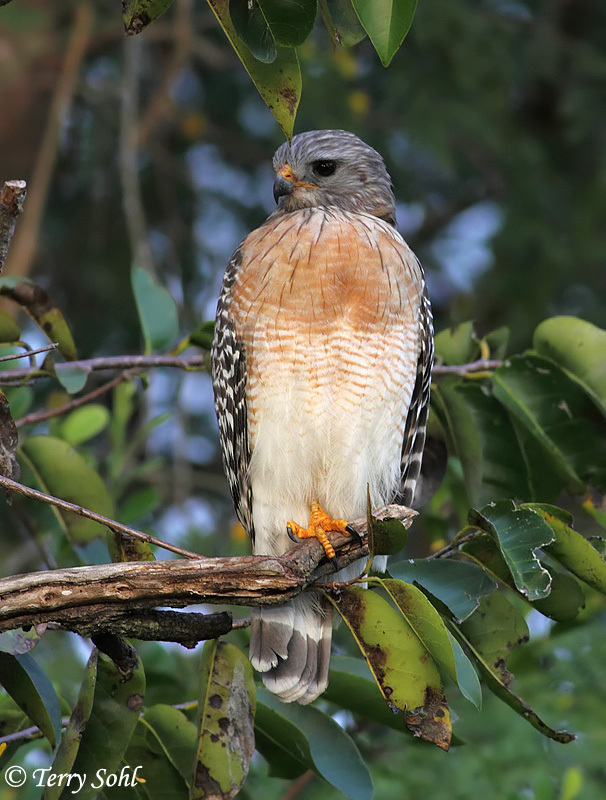 Diet: Diet varies with location and season, and may include small mammals, frogs, snakes, lizards, large insects, crayfish, and sometimes fish or birds. 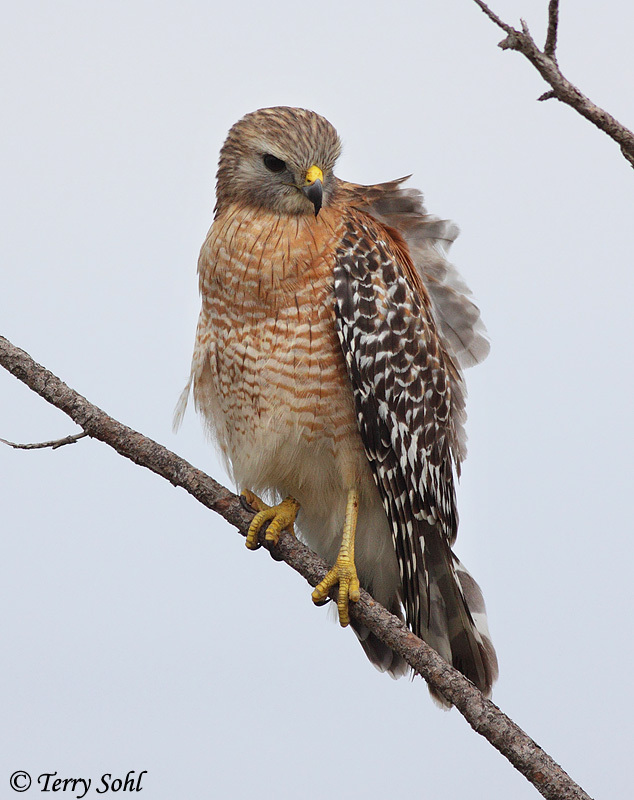 Behavior: Hunts from a perch, swooping out to catch prey that comes within range. 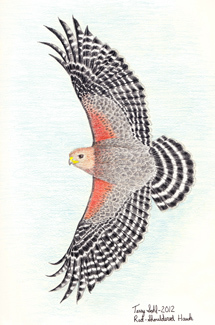 Males perform flight displays in courtship, flying upward and calling, then diving back down towards the female. Courting pairs can also often be seen soaring together in circles and calling to each other. Nesting: Non-breeder in South Dakota. In their normal nesting range, the nest is a platform of sticks, lined with softer vegetative materials such as leaves or moss, placed relatively high in a tree. 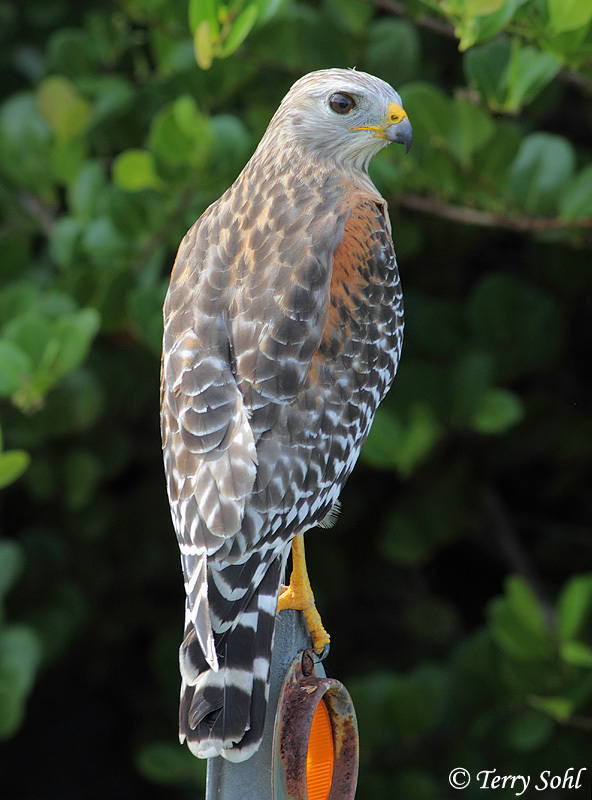 The female usually lays 3 or 4 eggs, and the female does most of the incubating. When the eggs hatch, at first the male brings food while the female stays with the young. After about 2 weeks, both parents help to feed the young. 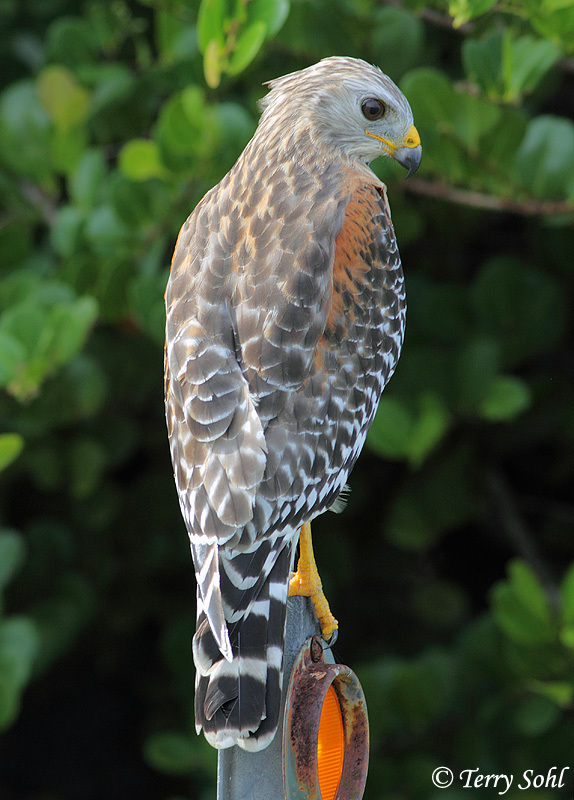 The young leave the nest after about 6 weeks, but typically stay with the parents for several weeks after fledging. 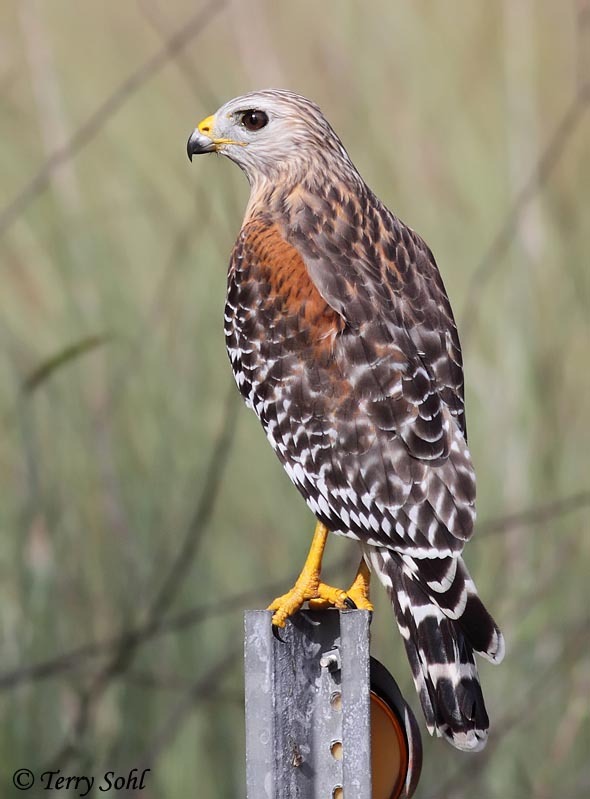 Migration: Primarily a permanent resident, but birds at the northern end of its range move small distances south in the fall. 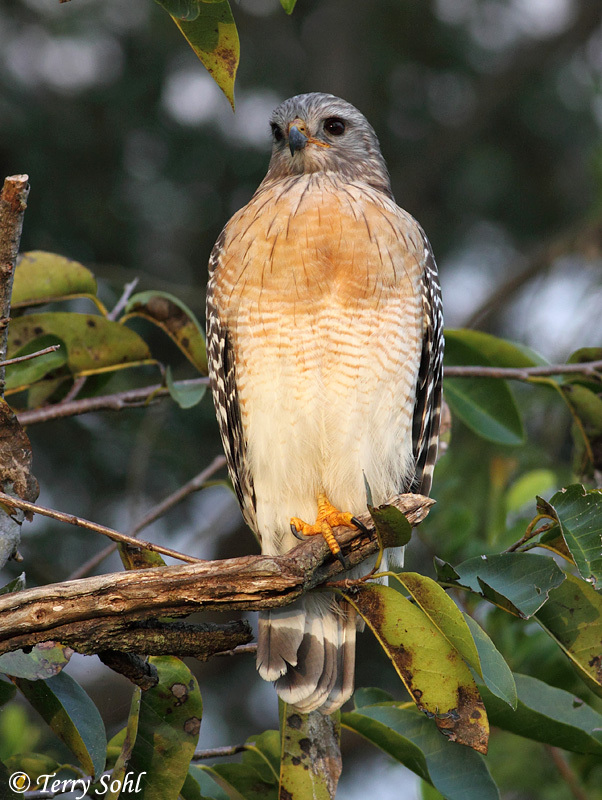 Similar Species: Broad-winged Hawk. 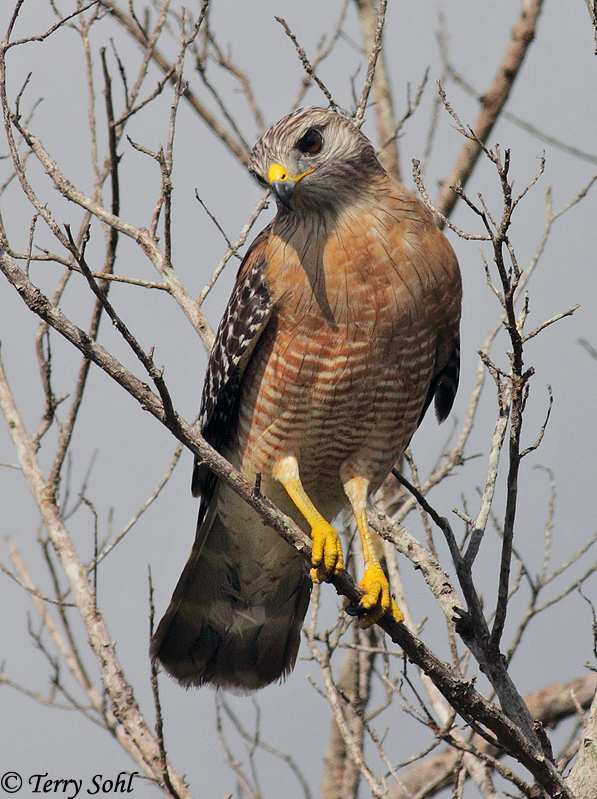 Click here for a page that describes differences between the "Buteo" hawk species, and identification keys for each. Conservation Status: Generally stable at the current time, but is at a reduced population and range than at historical levels. 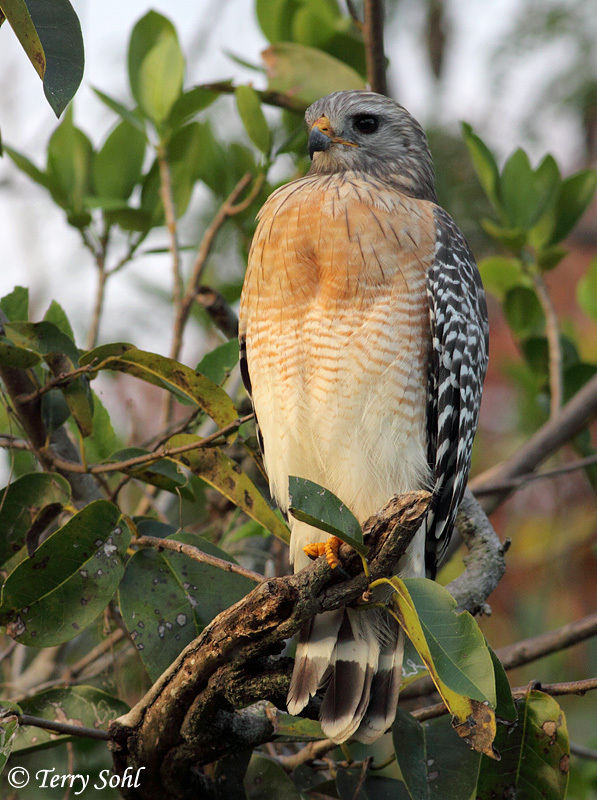 The IUCN lists the Red-shouldered Hawk as a species of "Least Concern". 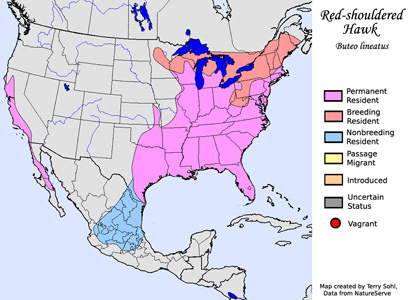 South Dakota Status: Casual migrant in the east, accidental in the west. Accidental in summer and winter.